Anchor Industries Safety Covers – Coral Swimming Pool Supply Co.
Coral Pools proudly sells Anchor Industries, Inc. Safety swimming pool covers. They have been the industry leader in durability and innovation since 1982. Eliminate the less than appealing appearance of the tarp with water tubes cover in your backyard and upgrade to an Anchor Industries safety pool cover. Protect your family and your investment with an Anchor Industries, Inc pool safety cover. Anchor Industries, Inc. has been a leading safety pool cover innovator for 40 years. Our mesh covers feature supportive webbing sewn to the underside for superior strength, our solid vinyl is coated (not laminated) for longer life, we provide a turn-key replacement cover program, and we stand behind every cover we manufacture. Custom and irregular shapes are our specialty. Anchor’s “Tension-Secure” Classic and 5-Star Solid Safety Covers contain super strong fabrics that resist tears, rips, sun damage, and the effects of chlorine and sun damage. These amazing pool covers even keep ALL sunlight out of the pool. 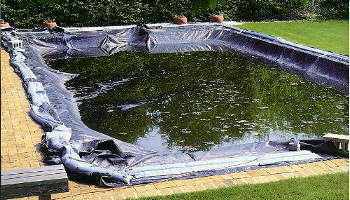 This ensures that clean up in the spring will be incredibly easy and your pool area will be attractive all year long. Both are relatively easy to install and remove and both the classic pool cover and the 5-Star Solid safety pool cover come with a Limited 10-year warranty. Mesh and Defender® Mesh Safety Covers are more light weight and a bit easier to maneuver than their solid counterparts. Defender® Mesh reduces chemical loss from the water and stops 98% of the sunlight from getting through and causing the growth of algae in your clean, chemically-treated and balanced chlorinated swimming pool water.